I had to share this AMAZING transformation by Red Living of a pine plank floor painted in Chalk Paint®. 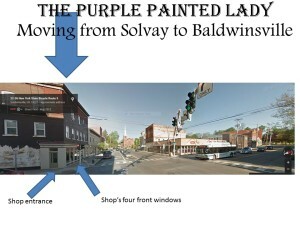 Paris Grey was the color of choice for this chic…well, soon to be chic Hair Salon – that opened a few stores away from their shop. 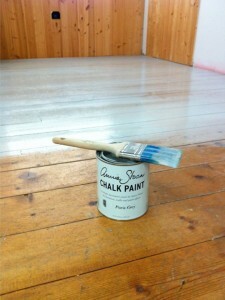 They painted the whole floor using Annie’s newest 2 inch flat brush. 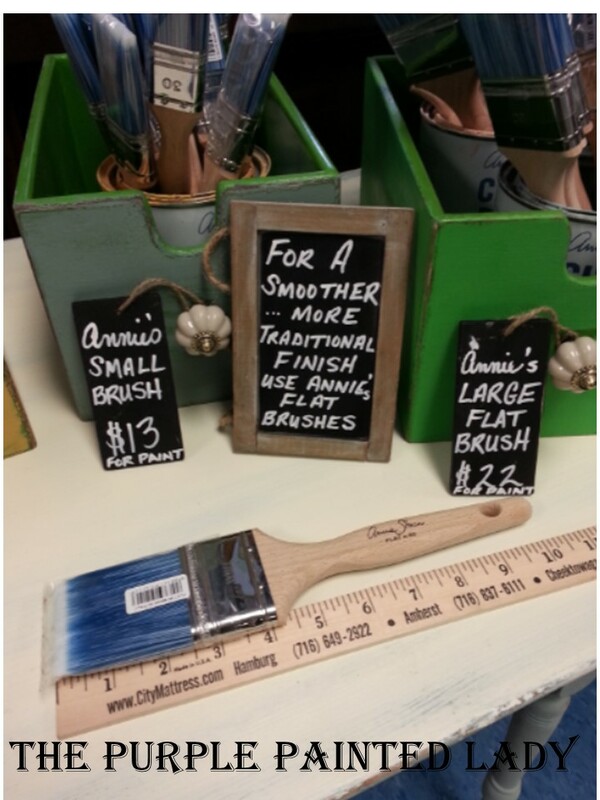 If interested in checking out Annie’s flat LARGE paint brush that gives a smoother finish, click HERE. 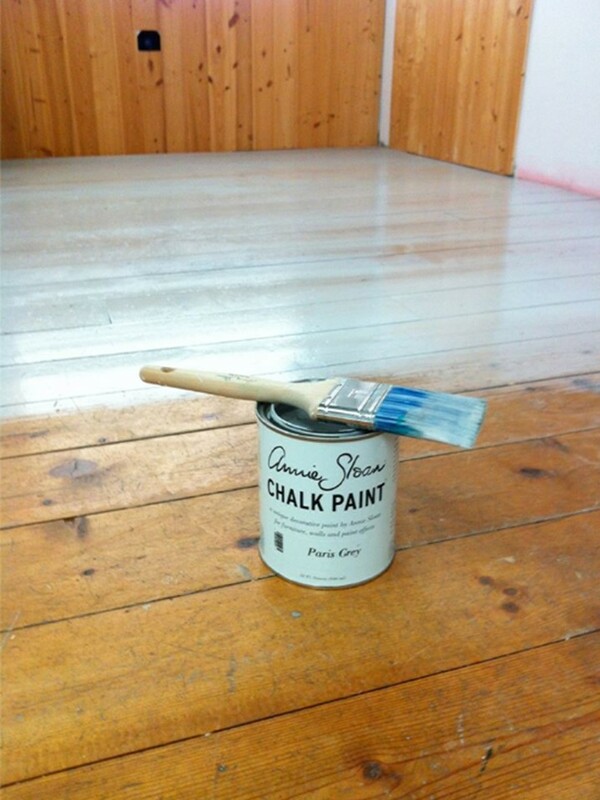 The floor is protected using Annie’s Lacquer. Her Lacquer was created for inside use on floors with high traffic! 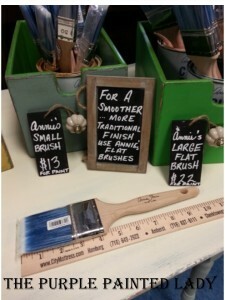 If interested in learning more about Annie’s Lacquer – click HERE. To read more about when to use shellac, click HERE. Red Living used 5 litres of Lacquer. The first coat was watered down a slight bit and they used a wide brush. The wide brush used to apply the Lacquer- they said made it go on beautifully. Most importantly with Lacquer- is that you do not dilly-dally. Apply it fast, with a confident brush stroke and do not back brush. 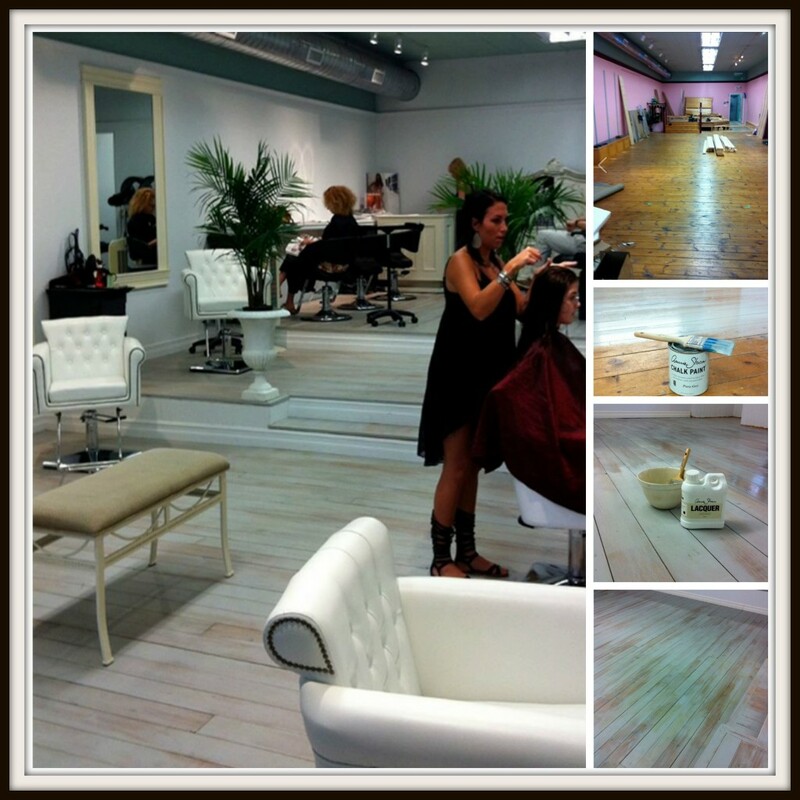 To read about Annie’s Lacquer – click HERE. 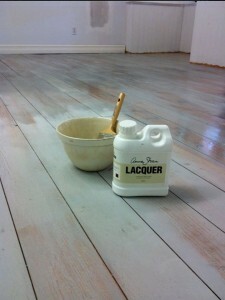 For cleaning painted floors coated with Annie’s Lacquer, you can use just about any household cleaner. A current fav of our Annie Sloan technical instructor is Fabuloso … they shared that they love the smell. WHEN YOU START PAINTING YOUR FLOOR (if going for a solid coverage effect) ….. after your first coat has dried…..if you get bleed through (and this is different then a lack of brush strokes that has a void and that is showing the floor beneath) ….apply two thin coats of Zinsser Bullseye Clear Shellac and lightly sand. Then paint your second coat of Chalk Paint®. It is important that you use the Lacquer to finish the floor if you do not want to see natural scuff marks. In fact- there are many reasons we think buying through us is the best. 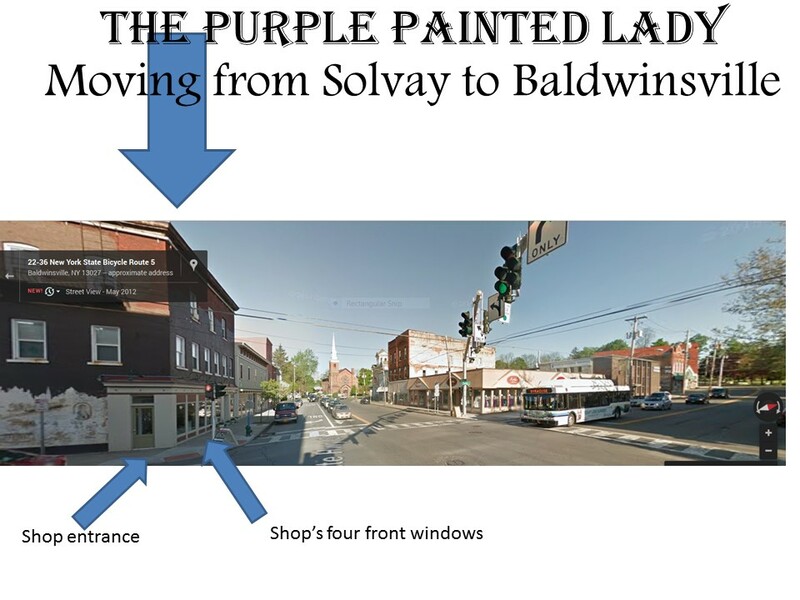 Read THIS little post about what sets The Purple Painted Lady apart from the rest. To visit our on-line store- click HERE. Lastly, we share a lot more information to help you get the most functionality out of your Chalk Paint® on our Facebook page. Consider checking it out by clicking HERE. While there- kindly consider LIKING us. 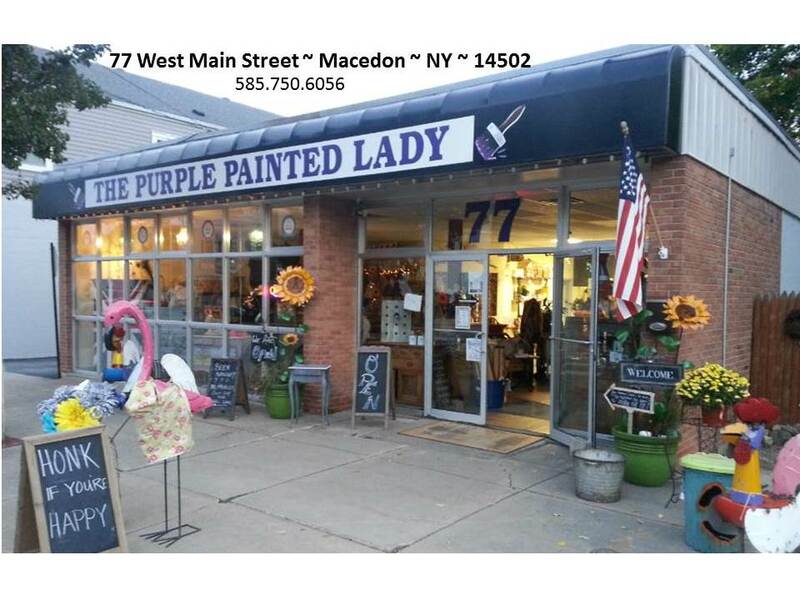 Click HERE for Store hours and information. 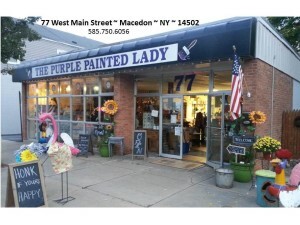 This entry was posted in How To and tagged lacquer, painted floors, Red Living by Tricia. Bookmark the permalink.